Everyone needs clean water and most people hope that the water coming from their tap is clean and safe. But year after year, the world’s water supply is getting worse and worse, not better. It seems like every time we turn around there is another “boil water advisory” or “water contaminant advisory” being sent out by local water municipalities or appearing in the media. It is no longer just Flint, Michigan with a water crisis, it is everywhere in the modern world. With this in mind, we felt that it was necessary to review all of the available water pitchers/jugs and rank them for 2018. Contributed by By Mark, Former Marine Reconnaissance Team Leader, Marine Infantry Officer, Cross Fit Coach, Endurance Athlete, and Survivalist. This water filter pitcher has all the design features you would want plus two choices of super strong American made filters for removing water contaminants like lead, bacteria, viruses & fluoride. Epic Water Filters products have been tested by multiple labs and last for 150 gallons which is 3 to 4 times longer than their competitors. How do they do it? Simple, each filter really has 3 independent filters inside? When one becomes clogged, the other two are still working. The first filter we tried was the Epic Pure filter which is gear towards common tap water contaminants like lead, fluoride, PFOA, PFOS, trace pharmaceuticals, and heavy metals. The other filter we tried that fits on the same pitcher was the Epic Nano, which also removes bacteria, viruses, giardia, cryptosporidium, and microbial cysts. PROS: This pitcher received a major redesign for 2018. 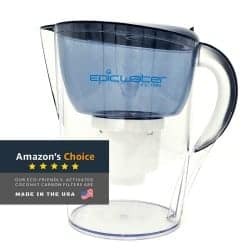 Epic Water Filters has made a ton of improvements on their already popular water pitcher, the Epic Pure Water Filter Pitcher. The new design improvements include: a new secure lid, better ergonomic handle, digital filter replacement alert, clear reservoir to see water level, reservoir design improvement to eliminate cross contamination between water in reservoir and filtered water in bottom of the pitcher, and one handed fill up operation. 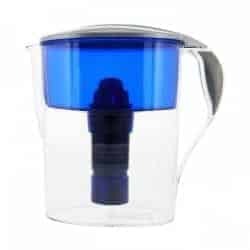 What we really like about this water pitcher is that this is one of the few filters to be tested to remove over 200+ contaminants including fluoride, lead, chemicals, pesticides and pharmaceuticals. In addition, Epic’s new filter, the Epic Nano which is made in the United States, also removes bacteria, viruses, and cysts. Every year, hundreds of thousands of people in the United States get sick due to drinking contaminated water with one of these waterborne pathogens both in the city and from wells. We do not know of any water pitcher on the market that is doing nanofiltration like the Epic Pure Water Filter Pitcher. In addition, millions of people in the USA are unknowingly exposed to harmful contaminants in the water like Lead, PFOA/PFOS, and Pesticides. We like the fact that the Epic Pure Water Filter Pitcher has a strong filter, removes more contaminants, and they provide 3rd party testing on their website. Also, taste matters and the water from the Epic Pure Water Filter Pitcher tastes fabulous, it was by far the best tasting water out of the jugs we tested. The Epic Pure Pitcher is available in either white or navy blue. CONS: The Epic Pure was great but the Epic Nano filter was slower than the other filters we tested but it was also the only filter to remove bacteria, viruses, and cysts. I guess if you want clean water, it takes a little bit of time to remove all of those contaminants. It is also the most expensive option out of these water pitchers but that might be the price you pay for clean water. 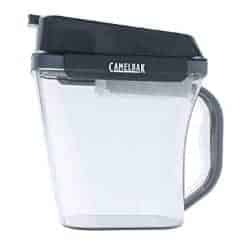 PROS: The Camelbak Relay looks pretty cool and the filter is crazy fast, as much as 10x faster than a normal Brita filter. This radical new design also works well to fit into small refrigerators and can fit into most refrigerator doors. I also like that the Camelbak Relay comes in several different colors, so hipsters can now get a purple water pitcher to match their kitchen. Camelbak Relay also made the water taste pretty good, it came in second in the taste test. CONS: With a fast filter comes low filtration. The Camelbak will change the taste of your water but that is about it. If you are looking to remove contaminants from your water, you might want to look elsewhere. Lead, Chromium 6, PFOA/PFOS, Chemicals, Pesticides, Herbicides, all pass right through this filter and into your glass. Also, when we first put the lid on the snaps they were really tough to secure. The snaps became more user-friendly after a very short time. It’s small in size (but this could also be a plus, depending upon preference. I like the small design, for example, and my husband would like it bigger). Other than chlorine and “odors,” it’s not clear what the filter removes from water. If you believe in the TDS meters for water quality, and a lot of people do and a lot of people don’t, then ZeroWater might be the filter for you. Made in China, the filter will get you water down to zero TDS rating for the first 20 gallons. PROS: While we don’t expect the ZeroWater pitcher to be winning any awards for artistic inspiration, we did find the ZeroWater pitcher to be a more ergonomic experience overall. In addition to being easier to hold and to pour, the handle felt more comfortable in our hands. It was still more bulky and heavy compared to the Epic Pure Water Filter Pitcher but if you are trying to decide between Brita and Zero, go ZeroWater all of the way. This pitcher filter is also pretty cheap. 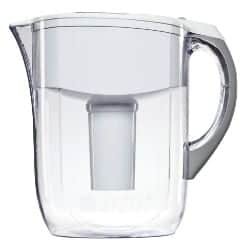 In addition, the ZeroWater 10-Cup Pitcher has a spout on the bottom of the pitcher, which makes it easier to pour water into a glass without taking the pitcher out of the refrigerator completely. For young children or the elderly, both of which can sometimes struggle with wrist strength, we think the ZeroWater pitcher is a good option. We also liked that ZeroWater removed some contaminants but again, nothing compared to the Epic Pure Water Filter Pitcher. CONS: Comparing the taste of different water filters is difficult, largely because it is simply so subjective. Nevertheless, we did set up a taste test, and found that Epic Water Filters & Camelbak beat ZeroWater overall on taste. We actually found the taste of Brita to be better than ZeroWater as well. The ZeroWater pitcher is also so cheap, it makes us wonder what the filter is doing and how it is made. Just say… Also, we did not like the big bulky filter – it feels like a small torpedo, seems a little bit much. PROS: The filter on the Pur Pitcher was quick and the water tastes great. The cost was “cheap as chips” so if you are on a budget, this might be the water filter pitcher for you. The ergonomics of the pitcher are fine and the operation was easy and straightforward. CONS: The Pur filter only lasts for 40 gallons and it appears to be fairly cheaply made. According to their website, they do remove some contaminants but again you are sacrificing clean water for speed. Personally, I would rather wait a few extra minutes and know my water is clean. Also, this filter does not remove bacteria, virus, or cysts and with 20,000 boil alerts in the United States over the last 3 years, this statistic might be worth considering when making your water filter pitcher selection. 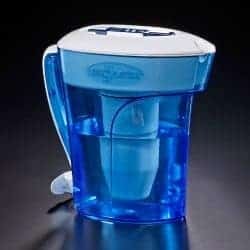 PROS: What water filter pitcher list could be complete without including Brita? Brita is pretty straightforward, good design, fast filtering, water tasted good. They have been in the business for awhile so they know how to put together a water filter pitcher. The pitchers are cheap and you can buy generic replacement filters for next to nothing. CONS: When you peel back the curtain, you find out that the Brita does not really remove a lot of contaminants. So if you are concerned (Like me) about things like lead, fluoride, chloramine, TTHMs, trace pharmaceuticals, herbicides, pesticides, heavy metals, and a lot more in your water, then you probably won’t be using a Brita. If you are on a budget and just want to change the taste of your water from Chlorine to something more tolerable, then you have found your match in Brita. After reviewing testing results for contaminant removal, testing the flow rate of the pitchers, the ergonomics & operation of the pitchers, and the all important taste test. We have concluded that the Epic Pure Water Filter Pitcher is the best water filter pitcher for 2018. With a “Love it” or your money back guarantee and high levels of contaminant removal, it is hard to go wrong with the Epic Pure Pitcher.